In AtoM, there are several kinds of CSV exports available exports from the Clipboard; export of archival description advanced search results; and an export of jobs completed. Each will be outlined below. Any authenticated (i.e. 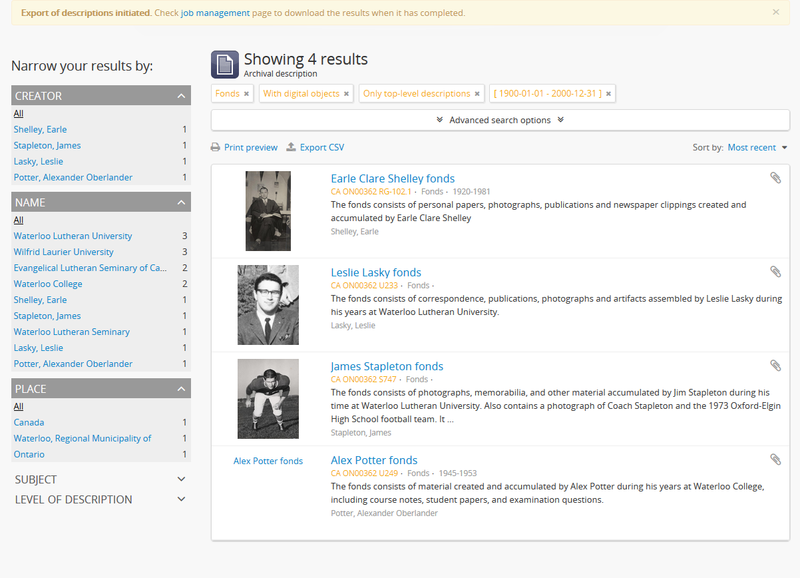 logged in) user can generate a CSV export of archival description Search or Browse results. The CSV export, after it is generated, is made available for download from the jobs page. You must be logged in to perform a CSV export of search results. Any user can generate a CSV export of Clipboard results. The CSV export, after it is generated, is made available for download from the jobs page. 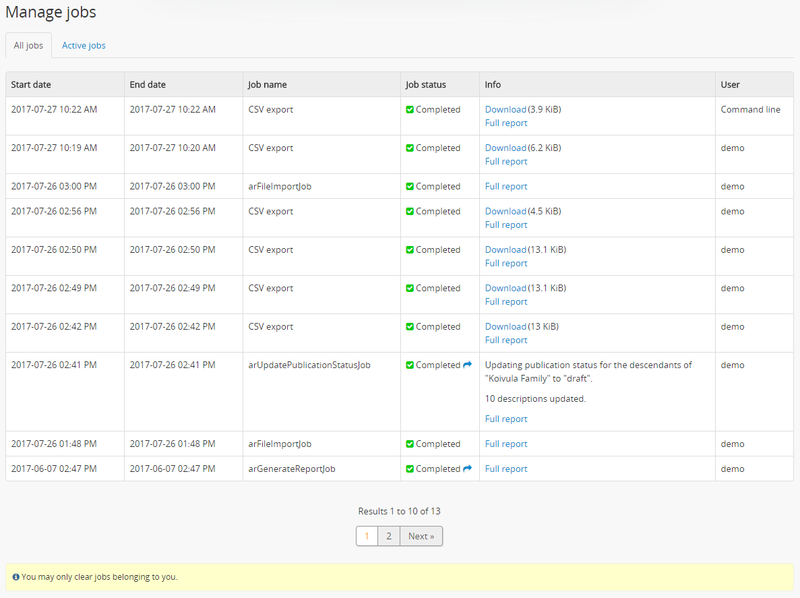 For public users who do not have access to the Jobs page, a notification will be displayed with a direct link to the download when the export is ready. You can also perform XML imports from the clipboard. For more information, see: Export multiple XML files using the Clipboard. AtoM will redirect you to a page where you can configure your export. Make sure the Format drop-down menu is set to “CSV”. 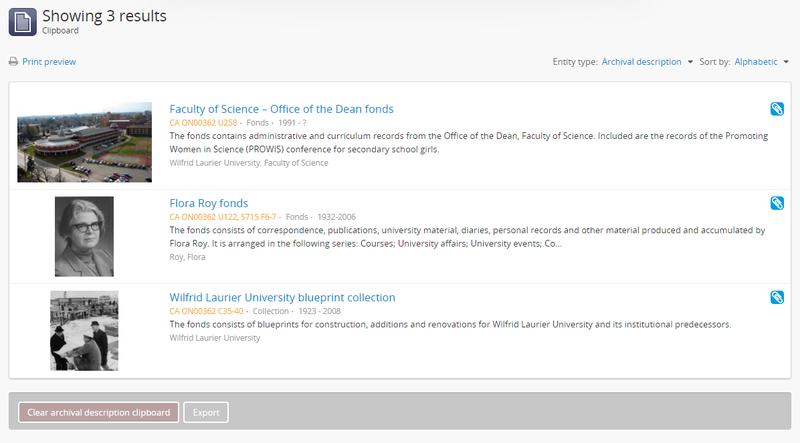 An archival description CSV export will include additional configuration options. 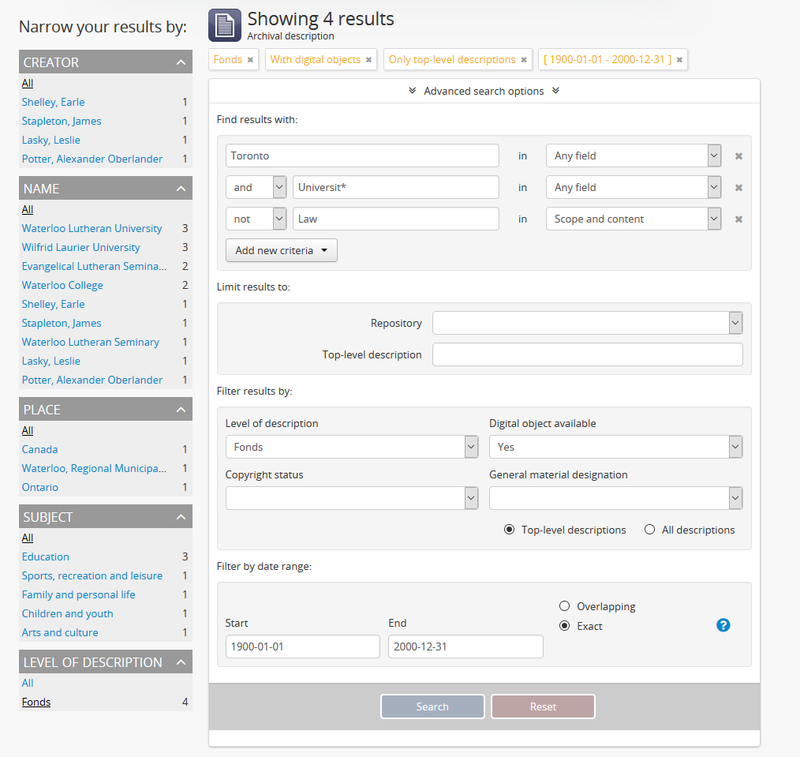 Public users can select whether only the current description should be exported or all descendants (i.e. lower-level records). If you want to include lower levels of description as well, click the checkbox marked “Include descendants”. For example, let’s say you want to export a collection that has a child series, and the series has several child item-level descriptions. 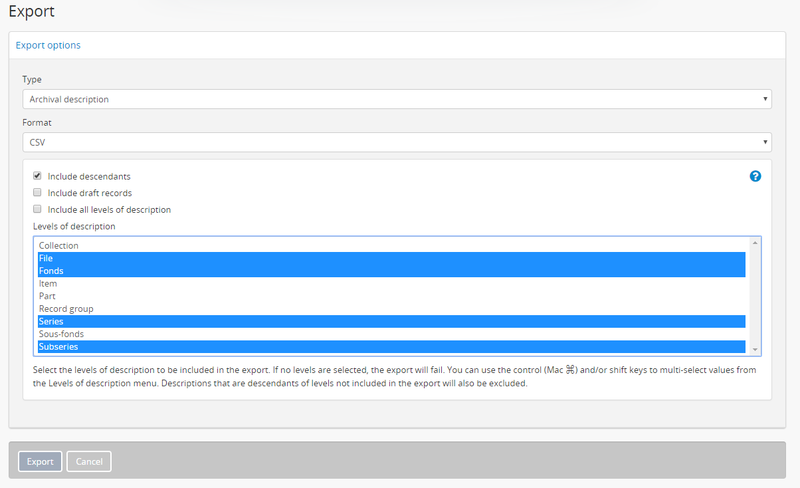 If you do not include “series” as a level of description, then the child items will also not be included in the exported CSV. The CSV export of the clipboard results will be generated by the job scheduler. After clicking the “Export” button, AtoM will reload the page with a notification about the job at the top. On the jobs page, authenticated users will find information about the export job, including a download link when the task is done. Check the “Job status” column - if it says “Completed,” then the job has successfully finished and you can now download your CSV. If it says “Running,” then the task is still being executed - try refreshing the page in a moment for an updated status. If the Job status column says “Error,” then the CSV export has failed for some reason - talk to your system administrator for assistance. See the Manage jobs page for more information.